Until the age of nine, Rosalie Kunoth-Monks lived on remote Utopia Station in the Northern Territory where she learnt the Aboriginal laws of her tribe, the Amatjere people. In 1953 she was discovered by filmmakers Charles and Elsa Chauvel and won the lead role in Jedda, a film that became an Australian classic. Later, Rosalie spent ten fulfilling years as a nun in a Melbourne convent before leaving to set up the first Aboriginal hostel in Victoria. 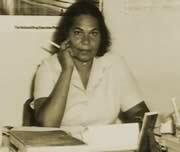 She has continued to be active in social work and politics and as a campaigner for her people. She was interviewed for Film Australia's Australian Biography series in 1995.